The use of seals can seem like an unusual custom for many foreign investors. The purpose of a seal is quite simple; instead of the commonly used signature in most Western countries, the seal is required for the validation of all major business, banking, or legal transactions. 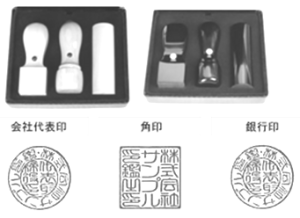 Most companies in Japan use 3 different types of seals to conduct business operations, which are: the ①Representative’s Seal or official corporate seal, the ②Bank seal, and the ③Square Seal. The Representative’s Seal is also called the “legal seal” or “jitsu-in” and is the official seal of the company. This seal must be registered at the local Legal Affairs Bureau under the name of the company`s representative director. After the completion of registration, you will be able to obtain the seal certificate at any time, which certifies the authenticity of the seal. You may be asked by your corporate vendors or customers to provide freshly issued copies of the seal certificate before you can validate agreements and contracts on the company’s behalf. Sometimes this means that you cannot secure a loan or a lease for the company, or even open a company bank account, without possession of the seal and its accompanying certificate. This is also the only “required” seal, because it can be used for all transactions conducted by the company. In contrast, the other 2 seals (Bank Transaction and Square) are not legally required, though they do have convenient and practical applications. This seal used for bank transactions is just that—a seal specifically registered at the bank where you hold your corporate bank account in order to make transactions. Though you may also register the Representative’s seal for this purpose, many businesses prefer to keep banking functions under a separate seal for the segregation of duties. This ensures a proper division of authority for banking transactions, which for example may be handed by your administrator, without giving them the authorization of the representative seal. The Square Seal is the most frequently used company seal, because it is generally reserved for everyday business transactions with reduced legal significance. This seal is usually stamped on invoices, quotes, and other documents with minimal legal ramifications. It can also be easily replaced when it becomes damaged and worn, unlike the Representative’s Seal, which needs to be re-registered at the legal bureau should it need replacing for any reason. The re-registration process can be long and arduous, which is why the use of Square Seals are highly recommended—it preserves the condition of the Representative Seal by minimizing its use, while establishing a relevant logo for unofficial use. As the preferred corporate partner for Accounting, Legal, Translation, and Incorporation services, Shiodome Partners Group can assist international investors through every step of the incorporation process, while providing valuable, cost-effective business solutions. 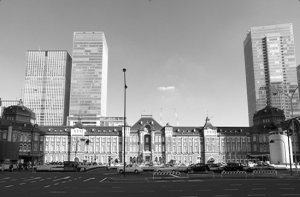 If you would like to request a consultation, you can contact us at inquiry@shiodome.co.jp, call our Tokyo office at 03-6228-5505 (+81), or submit a Contact Request Form at your convenience.